Slamdance screenplay competition winners: Tony Drazan, Nova Jacobs, David Gregg, John Douglas Sinclair, Chris Rodgers, John Stancari, David Diaan, Amir Ohebsion, Babak Shokrian, Russell Sommers, and John Stoddard (director of the competition). Image courtesy of Slamdance. Slamdance announced the winners of its 9th annual screenplay competition late last week at an awards ceremony which took place at the Writers Guild of America, west. Alumni of the competition, semi-finalists, and members of the WGAw Independent Writers Caucus were among the invitees present for the announcement of the ten winning scripts. The ten were chosen from an original pool of 1,800 submissions, and were judged by “numerous tiered-panels of screenwriters, filmmakers, and industry professionals.” Recent works to come out of the competition include winning scripts from “The Woodsman” (Nicole Kassell and Stephen Fechter) and “Maria Full of Grace” (Joshua Marston). 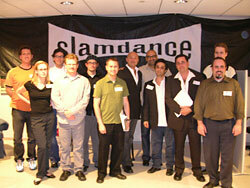 Cash prizes were given to the top three places in the amounts of $3,000, $1,000 and $500 respectively, and all 14 writers receive screenwriting software and will be read as part of Slamdance’s staged reading series, “Slamdance on Stage” in March and April of next year. They will also be awarded festival passes for the 2005 Slamdance Film Festival, taking place January 21-28 in Park City, Utah.